President Trump just concluded a meeting with Kim Jong-un that would have been unimaginable even a few months ago. 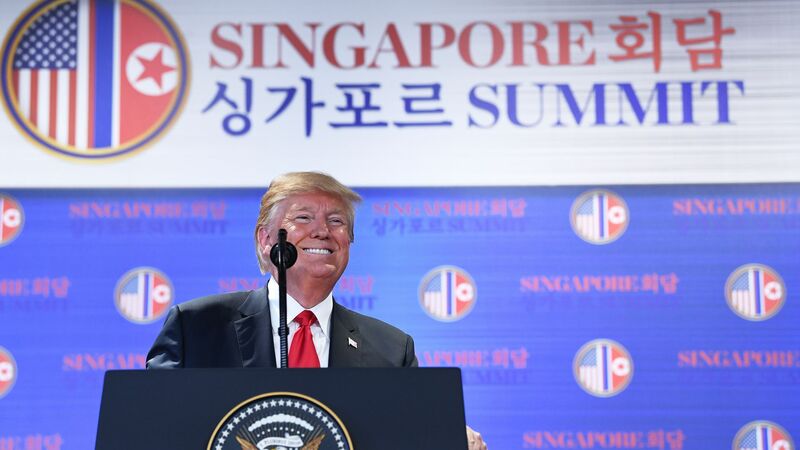 Where it stands: Much still needs to be worked out, including the specifics of denuclearization, security commitments to South Korea and Japan and some acknowledgment of concerns about human rights. But one point is clear: Talking is now the currency of U.S. relations with North Korea. And that’s a good thing. Not long ago, Americans fretted that their unpredictable leader would either launch or provoke a nuclear war with North Korea. As those fears recede, political space has opened for talks to prevent such an outcome. Yet this openness will not necessarily be permanent. As with the Iran nuclear deal, American politics matters. So if the Trump administration doesn’t move quickly to make real, sustainable and verifiable denuclearization gains, the window will close, leaving no diplomatic path forward. Democrats, despite historically supporting diplomacy, will look for gaps in the administration’s North Korea policy to exploit. Republicans, who have historically pressed for sanctions and military threats, will feel vulnerable to charges of hypocrisy if their president doesn’t deliver the gains he promised. The bottom line: For a successful diplomatic process that clears Congress, as Secretary of State Mike Pompeo has promised, Trump will need to move fast. And he will need to make the deal concrete. The good news is that this approach has been managed before. The bad news is that it hasn’t always worked.